Local snake catcher Nick Evans has taken to his Facebook page to show and tell of a snake rescue mission which he describes as his "most dangerous and difficult catch yet!". Listen as Nick Evans talks about the terrifying mamba rescue mission in Umlazi, or read the details under the podcast. I've seen many videos of snake catchers who are called out to find a snake, but it’s not lying out in the open making the rescue easy, it’s hidden and then the snake catcher has to rummage around looking for it. At this point, I'm normally sitting at the edge of my seat watching every move, because who knows with snakes, right? 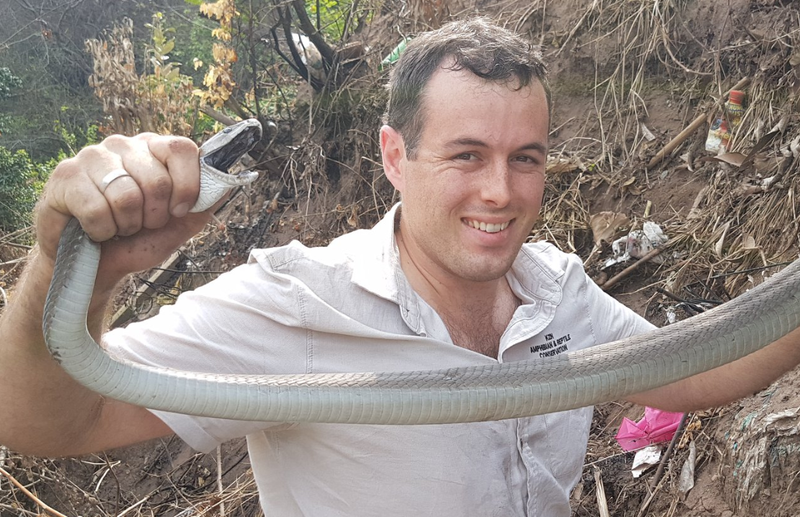 Durban-based snake catcher Nick Evans took his Facebook page to share a video of a mamba rescue. It was one of the biggest I've ever seen, and I could not stop watching the tricky rescue, which was under difficult circumstances. Nick was called out to Umlazi for the first time to rescue the mamba which was hidden deep in a tree. In his Facebook post, he described the area as one that was covered in litter, with nappies floating around everywhere. It seemed like quite the trek. With his partner in crime Duncan on hand, they used a pair of tongs to carefully remove the mamba. Locals watched on in suspense to see the snake emerge from the deep, dark section of the tree. "Duncan reached in as far as he could with his tongs, and managed to get a grip of it! He pulled it out, not knowing which piece of the body he had. The head popped out of the hole, and as I reached for it, it ducked back in, and slipped out of his tongs. So close! But we at least knew how to get at it. I tried. I held onto a root with one hand, ready to pull myself out of the danger zone if need be, and reached in with my tongs. I could feel I was touching the mamba, I just wasn't managing to grip it. Then, I did. I pulled slowly outwards. It wasn't resisting much, but I could feel this was a powerful snake," he said in the post. Eventually, they did manage to rescue the mamba, so all's well that ends well. However, the footage captured is nail-biting and nothing short of terrifying!